New statistics on opioid-related deaths in Canada through the first three months of the year have been released. More than 11 Canadians are dying every day on average. 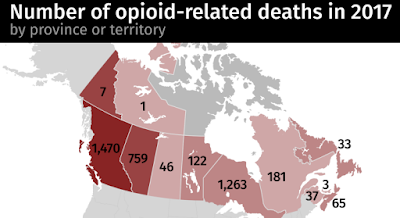 There were 1,036 apparent opioid-related deaths in Canada from January through March 2018. That's a 5% increase from the same period in 2017, and a 44% jump from the first three months of 2016. 3,996 opioid related deaths ocurred in 2017 compared to 3,005 in 2016. Overdose deaths have historically involved long-term drug users, but that is changing to recreational drug users and those living with chronic pain.